The following ‘Guidelines’ were established in 1978 (and periodically amended) to assure fair and equal hiring and promotion practices. Many HR departments do know know they exist. In a rare twist of government bureaucracy, the ‘Guidelines’ also represent best practices. They are usually the foundation for EEOC challenges. 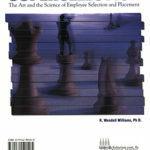 60-3.3 Discrimination defined: Relationship between use of selection procedures and discrimination. 60-3.5 General standards for validity studies. 60-3.6 Use of selection procedures which have not been validated. 60-3.7 Use of other validity studies. 60-3.9 No assumption of validity. 60-3.10 Employment agencies and employment services. 60-3.14 Technical standards for validity studies. 60-3.15 Documentation of impact and validity evidence. 60-3.17 Policy statement on affirmative action (see section 13B).